Why is it that summer always goes so fast and winter seems to drag on for the majority of the year? Some of you reading this may really enjoy winter. Fresh morning jogs, strolls in the park with leaves around your ankles wrapped in bulky clothing to keep out the cold. And of course the magic that is Christmas and the New Year. But me, I am all about the summer and the weather (hopefully good) that comes with it. Chillaxing in a beer garden, beach walks where you lose yourself in your surroundings, music festivals and more, I’m sure everyone has their own definition of summer. But of course there’s the refreshments – the ice cold taste of ice cream and popsicles. Here at Ideas Box we do both and both are always in such high demand throughout the summer. Both tricycles definitely have done the rounds this summer and with more events to follow, more and more guests will get to experience the wonders these tricycles hold. We have teamed up with POPS to provide outstanding ice popsicles that all can enjoy. With a range of flavours including classic champagne and Moscow Mule off their ‘naughty’ variety. Along with ‘nice’ flavours non-alcoholic apple and elderflower and my favourite strawberry and mint. They are refreshing and full of flavour and a huge hit with all that try them. With an pedigreed clientele as highlighted in a recent Daily Mail article, is it really any surprise that they are a company destined for continued success? We are proud to have a POPS tricycle. 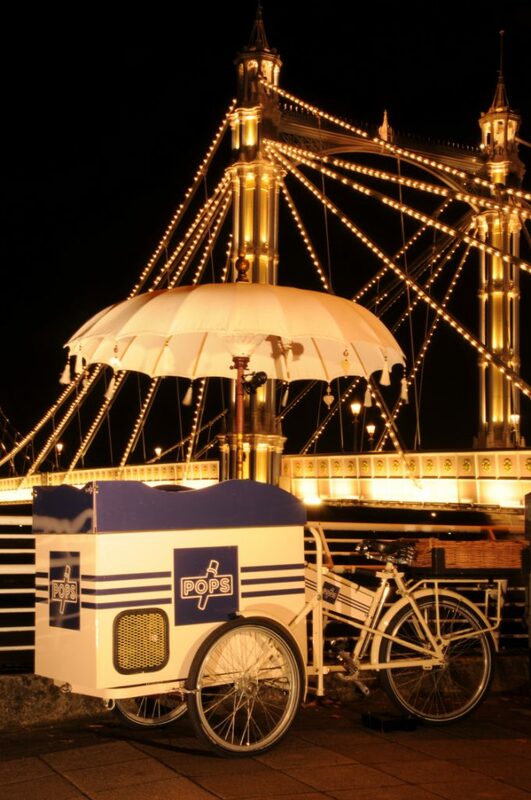 Displayed below, our blue and white POPS trike which draws in the crowds and really does personify our creative and unique ethos. ‘They taste great, look great and I couldn’t hand them out quick enough’. We look forward to many continued events serving POPS. Enquire about the POPS tricycles availability through this blog. You can also check them out on Twitter and Instagram here! Our ice cream tricycles is one of our most popular and no wonder with the hot even humid weather we’ve been experiencing. Well we have waited long enough! 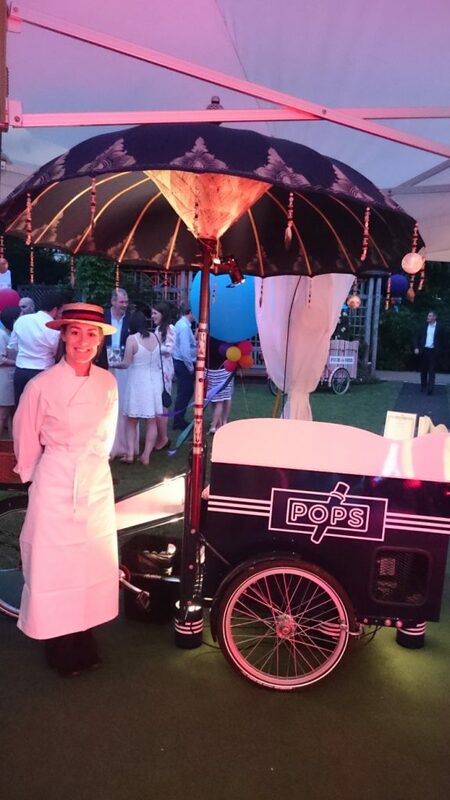 We have four different ice cream tricycles to choose from, three 1930’s style and one 1960’s style. Both styles equally as special as the other. From the photos below you can probably tell that as well! Colourful and full of life they really do add real character to events. And well of course they wouldn’t be popular if the ice cream was awful now would it. The ice cream is far from awful, it is in fact it’s amazing and truly delicious. I’ve tried it and all I can say is wow and we get zero negative responses from clients. They all pretty much say the same thing, ‘can I have some more’. To top it off today (19th August) is national soft ice cream day. First thought to have originated from Tom Carvel in 1934, he sold his newly discovered ice cream to holidaymakers in New York. You can read the full story here. Maybe we owe the ice cream we have come to love today all to that man?! Don’t forget to follow our Twitter and Instagram accounts here to keep right up to with all things Ideas Box and events we have been working. We are always happy to take any inquiry you may have. Next Next post: Sweet treats – with a sprinkling of sugar and chocolate of course!